Dennis Lindsey and David Morway were texting furiously. It was still the early stages of the 2011 NBA draft, but the upper-level executives with the Spurs and Pacers, respectively, were plotting something. Sometime around the no. 11 pick, they decided it was time to just get on the phone. The Spurs had already agreed to send George Hill to the Pacers for Indiana’s no. 15 pick, but only if a particular player or players were still on the board. Both teams were worried the deal would not happen by the time Utah was on the clock at no. 12. The Pacers didn’t even know which player the Spurs wanted, Morway says. But Morway was dubious as the 2011 draft unfolded. The Spurs had potential Hill-centric deals in place with teams above Indiana in the draft order, but couldn’t complete any, because each of those teams found someone they liked still available, says R.C. Buford, San Antonio’s GM. That meant the Spurs’ pool of draftees was nearly empty by the time Morway and Lindsey started chatting. Other teams that had talked with San Antonio about Hill were nervous the Spurs would back out at the last minute, anyway; several called top San Antonio executives during the draft just to make sure the Spurs were actually serious — that they’d go through with it. “We were worried and concerned right up until the last minute they might pull out,” Morway says. The Spurs loved Hill, and had developed him from a guy who struggled terribly in his first summer league into an above-average two-way combo guard. Hill would be due an extension after the 2011-12 season, still a year away, and the Spurs anticipated it would take between $7 million and $9 million per year to retain him. They knew it would be hard to pay Hill at that level without going far into the luxury tax. There were other ways to save money, and the Spurs explored them in hopes of keeping Gregg Popovich’s favorite player, Buford says. They reportedly tried to peddle Richard Jefferson’s awful contract, but couldn’t find a taker. The post-lockout collective bargaining agreement, which wouldn’t be signed until that December, might offer the relief of an amnesty clause, but that was far from certain, and such a clause would require the Spurs to pay out the amnesty victim’s salary. And so, with the clock ticking down on Indiana’s pick, the teams agreed to the final deal. The Pacers picked Leonard, who dutifully stood up, showed the world his prom suit, crammed a Pacers hat onto his head, and shook the commissioner’s hand. He had no clue he was about to be traded, though he remembered the Spurs interviewing him at the draft combine, even though they did not have a pick in or near the lottery. He was striding to his first round of media interviews when a league official shouted at him to stop — he might have already been traded. “It was a total shock to me,” he says. That’s not to say the Pacers “lost” the deal, or even that it’s not a “win” for them, too. They’re going toe-to-toe with Miami, and Hill has fit within their team almost exactly as the Pacers had hoped when they acquired him. And though it’s tempting to think what a George-Leonard wing combination might have been able to do on defense, Indiana’s defense is already the stingiest in the league. Collison, the point guard Hill supplanted and then made expendable, couldn’t earn Rick Carlisle’s trust in Dallas and has been a train wreck on defense. Hill isn’t a traditional pick-and-roll point guard, someone who gets to the rim with lightning quickness or probes a defense in the style of Chris Paul or Steve Nash. The Pacers’ offense, mediocre for the last two seasons even after the David West upgrade at power forward, could use a dash of that off-the-bounce creativity. Collison brought that off the bench and thrived in New Orleans, but he was never a reliable floor general. D.J. Augustin, Collison’s de facto replacement, has been bad on both ends. That’s a way of penetrating via the pass instead of the dribble, and Hill orchestrates this action well. He’s also emerged as a solid 3-point shooter from all over the floor,6 a key component for any team whose post players can draw double-teams. That kind of range also keeps Hill valuable even when he doesn’t have the ball, allowing George and Stephenson to handle it without compromising the offense. And yet: Both the imagined and actual reality tilt the scales in favor of San Antonio. For one, Leonard is already a very good NBA player earning nearly $11 million less than Hill over the next two seasons, before Leonard’s next contract kicks in. He became a viable corner 3-point shooter almost overnight, executing a plan the Spurs hatched for him even before he became a Spur. San Antonio had only a few days to meet with Leonard between the draft and the lockout, and it used that time to have him work with its developmental staff, including Chad Forcier and Chip Engelland, the team’s famed shot doctor. Leonard left with a written plan to rework his jumper by bringing the ball lower, level with his face, in the early part of his shooting motion, so that his release point would be above his head, he says. They were confident Leonard would stick to the plan, given everything they had heard about his work ethic, Buford says. He shot 47 percent from the corners as a rookie, but on only 49 attempts. He jacked 121 corner 3s this season and stayed accurate, hitting 43 percent, per NBA.com. He still struggles on non-corner 3s, but Leonard has gradually shown more individual creativity on offense this season. When defenders close out hard on him, Leonard can dribble by them, and either attack the rim or loft a nifty floater over a help defender. He’s flashed hints of a post-up game, shooting 19-of-27 from the block this season after hitting just one such basket in all of 2011-12, per Synergy Sports.8 Most of those attempts have come in mismatches against smaller defenders, but Leonard has a bunch of crafty moves — a righty jump hook he can shoot from either block (i.e., going middle from the left block, and using a baseline drop-step from the right block), and a solid midrange turnaround he can attempt going over either shoulder. The post game isn’t quite a weapon yet, but it probably will become one, and the Spurs will eventually be able to run those snug pick-and-rolls from the block with Leonard. By any measure, Leonard snagged a larger role in San Antonio’s humming offense this season. He logged more time, shot more often per minute, and got to the line more. 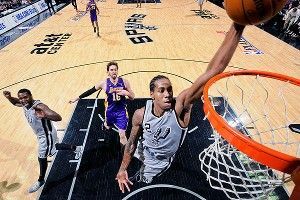 Data from motion-tracking cameras installed in the Spurs’ arena and 14 others shows Leonard dribbled the ball 51 times per game this season on average, up from 26 bounces per game as a rookie, and touched the rock 14 more times per game, according to STATS LLC, which runs the cameras. But in the short run, the Spurs got Leonard for his defense. The 2010-11 Spurs were either shaky or small on the wing, a no-no for any team interested in competing with Kevin Durant or the new Heat. Those Spurs started a declining Jefferson at small forward, and when Jefferson rested, they usually went with a smaller three-guard set in which Manu Ginobili effectively played small forward. San Antonio understood that would not cut it. The Spurs thought Leonard might be the answer, but it was unclear if he’d develop into that answer before age chipped too much away from Tim Duncan, Ginobili, and Parker for the team to contend as Leonard rose up. 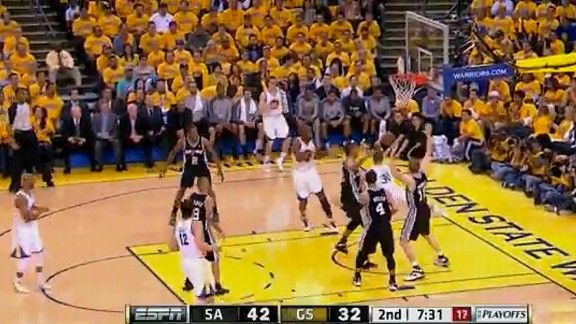 Clever players can hurt him with backdoor cuts, and teams can occasionally catch Leonard over-helping in the paint, even from the strongside corner, when nothing really threatening is going on inside. He’ll miss a perimeter rotation here and there. Leonard’s footwork and timing are elite already, at least when he’s operating at peak awareness. He’s an expert at sniffing out the moment when he should recover to an outside shooter, and when a pass is in the air heading toward that shooter, it’s remarkable how much ground Leonard can cover before the catch. Watch a reel of Leonard dealing with spot-up shooters, and you’ll mostly see those shooters starting their shooting motion only to realize midway through, Oh, crap, this large man with giant arms and hands is coming at me, and he’s going to block this shot or make me loft it so high it will look like an Al-Farouq Aminu prayer. Leonard forces those guys to put the ball on the floor and dribble themselves into tough 2-point shots — tricky runners Leonard can often challenge from behind because his nimble feet allow him to stop, change direction, and recover faster than most guys. Leonard is both steady and fast-twitchy at once, a rare combination. He keeps his balance when recovering out to shooters at high speed, a skill several perimeter players have told me is the single hardest aspect of defense the NBA offers. He slithers and fights through screens on and off the ball, which is why Popovich trusted him to defend Mike Conley for key portions of San Antonio’s Game 3 win in Memphis on Saturday. In other words: It’s hard to see the Spurs where they are now, seeking a fifth title in the Duncan era, without the emergence of Leonard.9 The Spurs with Leonard have a higher ceiling than the Spurs with both Hill and Parker. The same isn’t quite as true for the Pacers, both today and going forward. They’re probably better off as is, considering the gap between Hill and Collison, but a starting five of Collison-George-Leonard-West-Hibbert would have been a two-way force that might match up a bit better, with Danny Granger out, against Miami’s Dwyane Wade–LeBron James pairing. These Pacers could have run out Stephenson for a few minutes in Collison’s place, featuring a feisty and huge wing trio. Turnovers likely would have been an issue, but the Pacers already have the second-worst turnover rate. The cap implications, past and present, are also more thorny from Indiana’s perspective. Hill has lived up so far to his five-year, $40 million deal, but he’s already 27; Leonard is only 21 and has two years left on his rookie contract. Donnie Walsh, the Pacers’ current president of basketball operations, said the team knew there would be competition for Hill last summer, when Hill was a restricted free agent, and sought to quash that competition by offering both a fifth year and going up to $40 million total. “I knew signing him to that number, we would not be susceptible to counteroffers from other teams,” says Walsh, who adds that the negotiations were fairly easy. But something funky happened with Indiana’s cap management during the early days of free agency last summer, before Hill and Hibbert signed their new contracts. With common-sense decisions on cap holds, the Pacers could have had about $10.5 million in space that would expire the minute those two signed their new deals; they had a window in which they could operate under the cap via that space.10 Indiana needed a backup center, and instead of signing Ian Mahinmi, an unrestricted free agent, they traded Collison and Dahntay Jones for Mahinmi in a sign-and-trade. Coming to a quick agreement with Hill obviously made Collison expendable, and he became the bait for Dallas swallowing Jones’s $2.9 million player option. Collison would have been essential had the Pacers feared Hill walking away. Sussing out the timing of all these transactions can be tricky, but the Hill contract played at least a small role in sending Indiana down a rabbit hole of moves that failed in the end to upgrade Indiana’s paper-thin bench. Mahinmi has been useful, but when you’re playing Sam Young key postseason minutes, you need another wing body. The Pacers’ salary situation is also tighter than it might otherwise be going forward as they prep again to upgrade that bench. West’s cap hold vaporizes all their potential cap room this summer, and a new two-year deal for West, plus the max salary coming up for George,12 would probably keep Indiana capped out — or close to it — until after the 2014-15 season. That’s not a terrible thing. This team is already very good, with room to grow, and their cap sheet even with these West and George deals will be clean enough (in the worst case) for them to use the full midlevel exception, engage in sign-and-trades, etc. Things would be easier with Leonard on a rookie deal instead of Hill at $8 million, but Hill is a talented player whose status as a local hero and devoted community servant has helped the Pacers rebuild their bond with Indianapolis. Another thing that has helped repair that bond: a trip to the conference finals, and a spirited battle there with the favored and glamorous Heat. Even if the Spurs and Pacers aren’t “winners” in an equal sense, the trade has worked out fine for Indiana in the big picture; it’s as if it got to choose between two very delicious slices of pie. The Pacers got the slightly less delicious slice. And in the short run, it’s unclear if either of these teams would be in the conference finals without this deal. This trade received nothing like the attention of the Rudy Gay deal. But less than two years later, it’s done far more to affect the championship-level landscape of the NBA. Indiana also thought Hill would be a nice change of pace from the incumbent starter, Darren Collison, a shorter and quicker player with more traditional pick-and-roll skills, Morway says. They also had the sense they’d need a bigger point guard for defensive purposes in the playoffs, when teams pick away at any advantage they can find. “We knew that as we got deeper into the playoffs, it was going to be hard for Darren Collison to guard guys like Derrick Rose and Rajon Rondo for 40 minutes a night,” he says. The final year of Parker’s deal is only partially guaranteed. Buford badly wanted to bring Lorbek over before last season, but they couldn’t find the right deal after giving a portion of the midlevel exception to Boris Diaw, Buford says. Lorbek, now 29, has since re-signed with FC Barcelona, and getting him to San Antonio over the next few seasons will be tricky. “I can’t tell you what it will take to get him here now,” Buford says. The Spurs declined to make Popovich available for an interview. I realize Lance Stephenson is delivering the pass in this photo, but Hill does the same more often. He actually shot better from above the arc than on shorter corner 3s, per NBA.com. In a trivial bit of small-sample-size theater, Leonard actually ranked as the league’s most efficient post player this season, per Synergy. The Russell Westbrook injury helped, to the degree that it probably should not be a footnote. The Pacers could also have stayed over the cap by holding off on the renunciation of several free agents they didn’t want, a course that would have put the midlevel exception in play for them. But they chose to renounce those free agents and stay under the cap. I was bullish on Green this season, but Jones would be more useful at this point. He’s eligible for an extension this fall, and his rookie deal expires after next season.